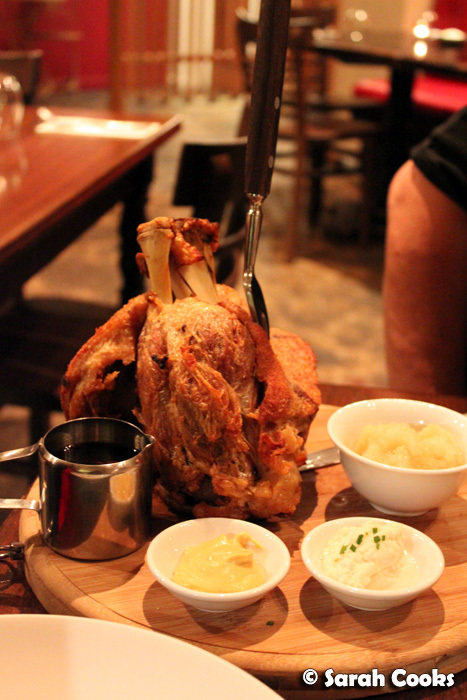 That is Muttis' crispy-roast pork hock, served with apple sauce, house-made horseradish, mustard, and a caraway seed & dark beer jus. Absolutely beautiful! We took my parents to Muttis a couple of weeks ago to celebrate my Dad's birthday and welcome them both back from Japan. They'd never been to Muttis before, and we thought they'd appreciate a tasty, hearty meal. I absolutely adore Muttis, and I think they've gotten even better since my last visits! They're certainly busier than I previously observed - on the Friday night we visited the dining room was pleasantly full and with a buzzing atmosphere. Yay! We started with some beer, glühwein and pretzels. (Being aware of the big portion sizes, I steered my parents away from ordering any entrees). 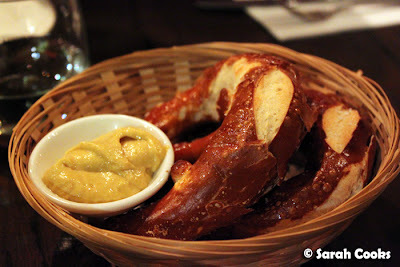 The pretzels were warmed and crispy - yum yum. 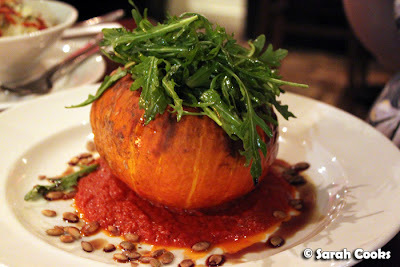 One of two vegetarian options, the slow cooked baby pumpkin was an extremely generous serving: a whole baby pumpkin, stuffed with polenta and served with Paradeiser (AKA tomato) sauce, pumpkin seeds and rocket. It was delicious, but very filling - she only managed to eat about half. And now - ta-dah! - I present to you the fabulous pork hock that my dad and I shared. 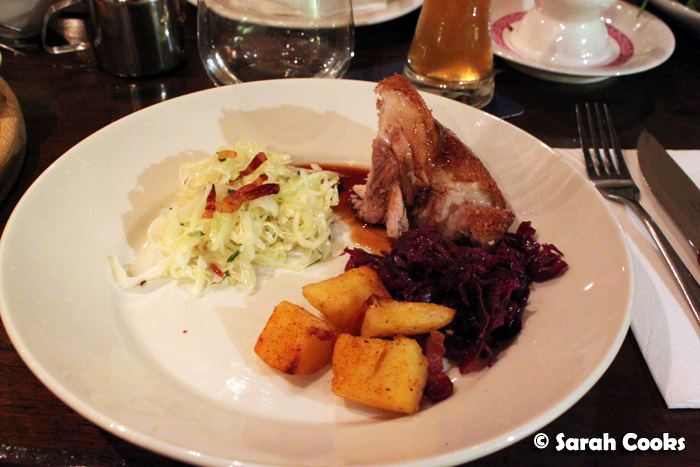 The pork was perfectly done: juicy and tender flesh surrounded by crispy, crispy crackling. (It totally puts my PORKTOBERFEST pork hock to shame.) I really need to get Chef Thomas to teach me his recipe! Apart from the sauces and condiments, the hock came with bratkartoffeln and a cabbage salad. 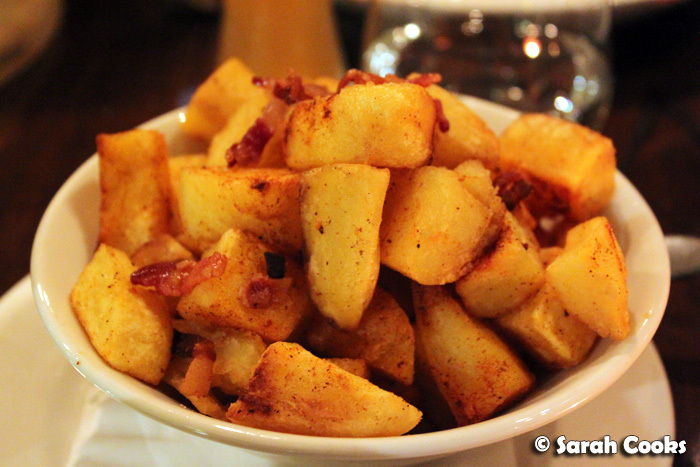 The cubes of potato were crunchy on the outside, fluffy on the inside, sprinkled with little pieces of bacon, and totally addictive. Yet more bacon! Love it. 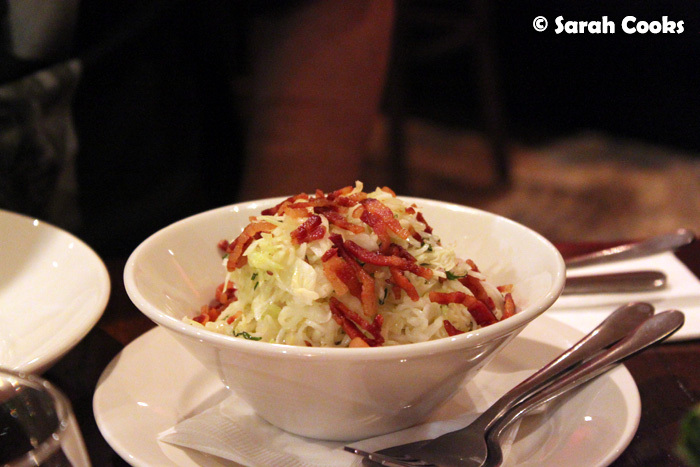 The cabbage salad had a sharply astringent dressing, and loads of chives and bacon for extra flavour. It was a great contrast against the heavier meat and potatoes. We also ordered a plate of rotkohl to share between the four of us - not that we needed any extra food, but everything tastes better with rotkohl! Even between the two of us, we couldn't finish the pork hock (it would have easily fed three, in my opinion), so we actually doggy-bagged it home. Ordinarily I wouldn't go the doggy-bag route, but the food was too good to leave behind! And I actually made a wonderful soup with the leftover hock later in the week, so nothing went to waste. The super-nice manager Ulrich happened to recognise me from my previous reviews, and came over to our table to say hi and have a chat. Chef Thomas also came out to say hi, and shared a raspberry schnapps with my dad for his birthday. Prost! We weren't intending to order dessert at all, but when Ulrich came to our table with three desserts for us to share (his shout! ), well, we couldn't say no! (Not that he would have had to twist my arm, hehehe). 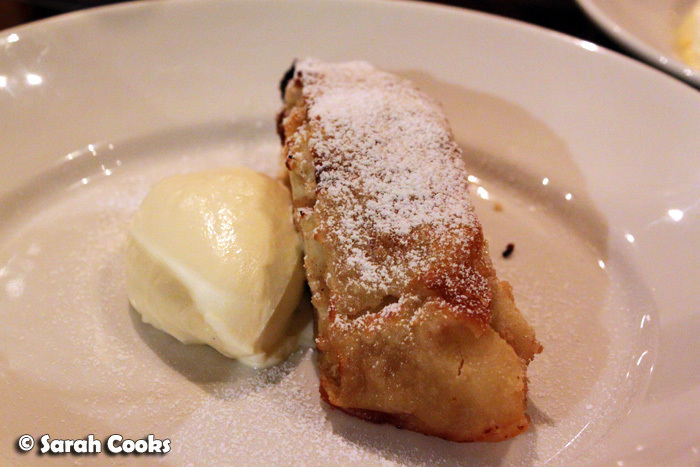 Crunchy, warm, and full of apples. Need I say more? I generally wouldn't have thought to order a sweet pretzel, (I'm used to the plain salty ones), but this was truly fabulous. Warmed up, and sprinkled with cinnamon and sugar, it was kind of like a bready doughnut, made even more delicious by the addition of cream and blueberry jam. The final dessert, Eis Palatschinken, was my favourite of the night: thin crepes were wrapped around creamy vanilla ice-cream, covered in a beer-infused dark chocolate sauce and sprinkled with crunchy almond flakes. 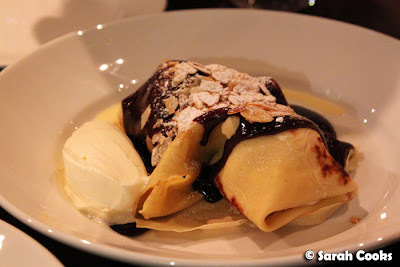 The beer gave the chocolate sauce an intriguingly bitter edge, which tempered the sweetness of the dessert overall. My dad loved the dinner - success! I'm definitely looking forward to going back soon. They're coming up with a new winter menu at the moment, which I'm sure will be great. 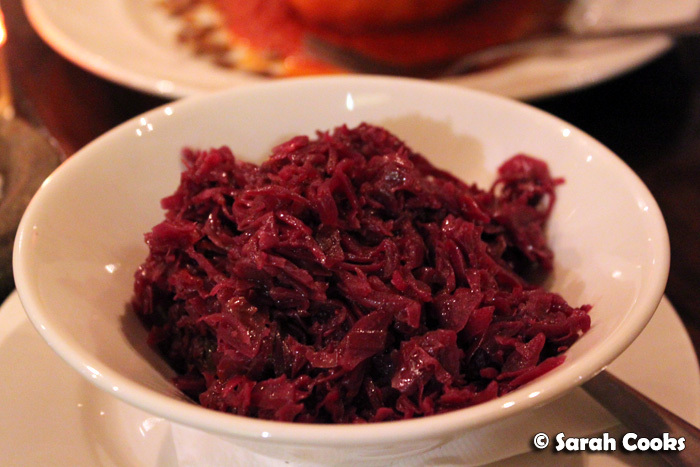 We saw a few tables having the special that will be on the new menu: a choucroute-style dish with sauerkraut, sausages, kassler, potatoes and more, served on a big platter. 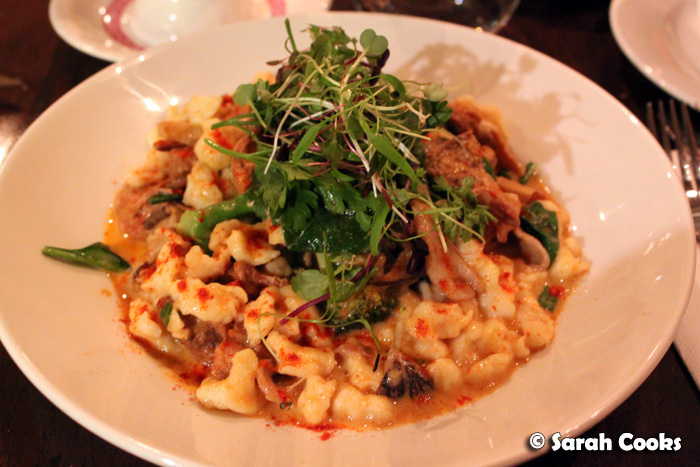 I really think Muttis is a hugely underrated restaurant: the food is fabulous, hearty and well priced, and the service is great (even before Ulrich introduced himself). Our waitress was really nice and very efficient, and we were never left searching for help - she was topping up waters, re-taking our drinks orders and clearing our plates before we even had to ask. 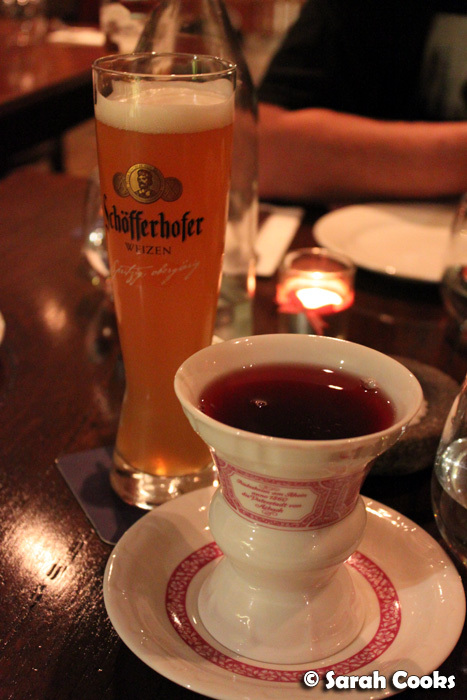 And a big thank-you to Ulrich and Thomas for the schnapps and desserts! 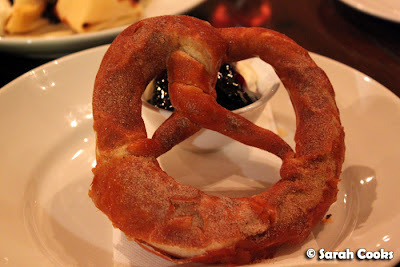 You can read about my previous visits to Muttis here and here. This is making me want to pack my bags and head back to Germany :( looks so delicious. 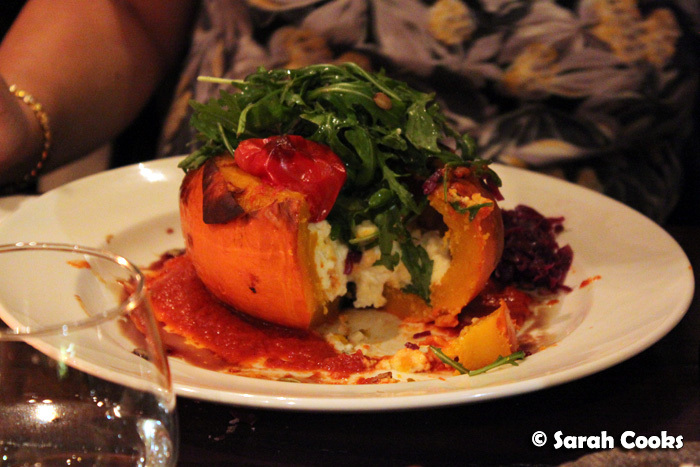 I'm especially impressed by the look of that stuffed pumpkin, what a cool vegetarian dish. 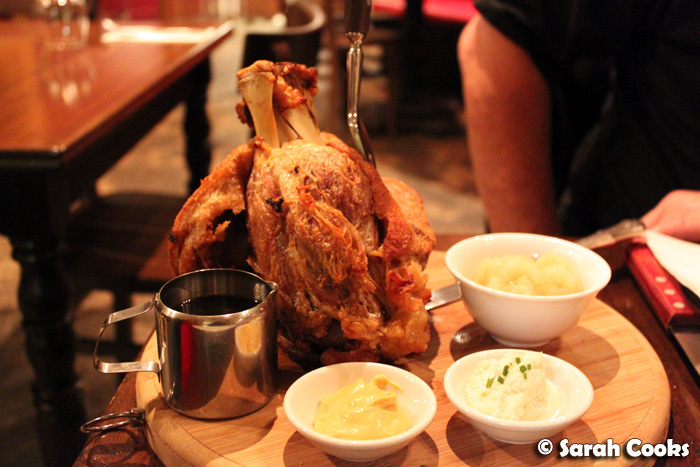 I want a pork hock and some sauerkraut now! Looks delicious. Oh my! I think I should go here! Those dishes are looking so delicious! Such a good set of food! I want!